Yesterday, I cooked real food from scratch. And I made the best chile verde I’ve ever made. In fact, it was so awesome I ate two bowls. I lost my original recipe, so I went searching on the food network and found several. I ended up using a little of theirs and a little of mine, partly because I couldn’t find everything they called for. I had to use what I could get. First, I put 8 tomatillos into the oven to roast (350-degrees for about 30 minutes.) While that was going on, I moved to the chopping and cutting. I cut a 2-1/2 lb. pork loin roast into 1” squares. 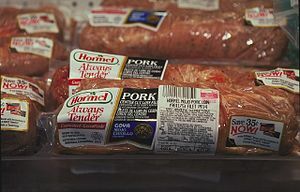 (Personally, I don’t like stews and chiles made with junky meat.) Then I liberally salted and peppered them. I used 2 tsp. salt and 1 tsp. pepper. Then I dredged them in about 1/2 cup of flour. Next, I browned the pork cubes on all sides in 1/4 cup of cooking oil. While the pork browned, I went at cutting into 1” squares, 2 green bell peppers, 2 poblano chiles and 2 yellow onions. Depending on how much heat you like, you could add a couple of jalapeno peppers. After the pork cubes browned, I removed them from the skillet and added the peppers and onions to the same skillet. While they sweated, I minced 3 garlic cloves and chopped the roasted tomatillos into 1″ squares. I also chopped 1 bunch of cilantro. I put the pork cubes and the peppers and onions into the Crockpot, added 2 tsp. dried oregano and 2 tsp. ground cumin, then covered it with a bottle of LaSabrozita Verde sauce and mixed it up. Next I added 2 bay leaves and the chopped tomatillos and the garlic and cilantro. I let the whole thing cook for 4 hours on HIGH. I made cornbread, too. Cornbread isn’t Mexican food, but it goes really well with it. My husband, being from the Far North, doesn’t appreciate cornbread as much as we Texans do, so I seldom make it. And when I do, I have to eat all of it by myself. (It’s no wonder I’m fat. 😦 ) So I halved a square of cornbread and put it in the bottom of a bowl, covered it with a generous serving of the chile verde and topped it with a dollop of sour cream. I love Mexican cuisine. I grew up with it and it’s as common in Texas as chicken-fried steak and cream gravy. In Mexican restaurants, just like food served in all restaurants, sometimes it’s good and sometimes it isn’t. But one thing I’ve noticed about good, authentic Mexican food cooked from scratch. It’s labor-intensive. It calls for sooo much preparation before you can even get started on the cooking. But if you stick with it, when you finish, it’s usually worth it. I know of many Hispanic women who make tamales. I’ve attempted tamales only once. Too hard. I also have a Hispanic friend who makes her own chorizo from scratch. What you buy in the grocery store pales in comparison to hers. I badgered her for weeks to share her recipe with me, but like many scratch cooks, she uses a little of this and a little of that, so she had to think about what to write. But she finally did give me a recipe on paper. I know it’s delicious because I’ve eaten hers, but I haven’t yet made it myself. It doesn’t intimidate me nearly like tamales do. When I make it, I’ll give you a full report. My taste buds are already on alert for some chroizo and scrambled eggs. Hmmm! What about you? Do you have favorite food you like to cook, one that brings raves from your friends and family? This sounds delicious. Okay. I’m in the suburban wilds of Canadaland. What is a tomatillo? And how could I downgrade the spice in this a little bit. I’m more like your sweetie when it comes to “hot & spicy” food. Hi, Elen, and thank for stopping by. A tomatillo is a tarty fruit that is the basis for a lot of Latino sauces. 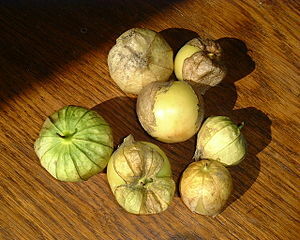 A picture of tomatillos is in the blog post. I don’t know if they would be easy to find in Canada. I lived in the Pacific Northwest for many years and I never saw them in the grocery stores up there. However, with the broader expansion of the Hispanic population, the demand would be greater now, so you might find them. You can look them up in Wikipedia and find out more about them. In the particular dish that I made, I think the thing that made it hot was the La Sabrozita Verde sauce I used. That is a bottled sauce I bought in the Mexican food section of a local grocery store. Other than that, the peppers in the dish were fairly mild. I think you could substitute chicken broth for the sauce and make it not quite so hot. P.S. Try the first link at the bottom of the blog to get to more information about tomatillos. Chili verde is easy, and the only thing about tamales is that they’re time-consuming to make. The thing my husband ABSOLUTELY loves, and I have to make before football games is my Painfully Hot Habenero Wings. I use about a dozen habeneros and a handful of pequin peppers, along with tomato paste, honey and salt, and let the wings marinate over night to intensify the heat. I have to wear gloves during every process of preparing and cooking them, but for him, it’s worth it. For my son, it’s when I make him a rack of ribs (which take about a day to get right), and my daughters (the poor little tender-tongues) like tortellini carbonara. If I just want to please myself, it’s comfort food — either meatloaf or chicken pot pie. Hi, Tracy….You’re a brave woman. I *never* cook with habaneros. I can see myself wiping my eyes or something and destroying myself for a day or two. Fresh jalapenos are bad enough. That sounds like a great sauce though. Do you put sugar in your cornbread? I don’t because I don’t like sweet cornbread. But my sister loves it sweet. Hi, Billy…I put two tablespoons of sugar in my cornbread. It doesn’t seem to be real sweet to my taste buds. That’s just the way my grandma always made it. She also made Malt-O-Meal bread, which is like cornbread, but made with Malt-O-Meal cereal. It’s really good. I think the recipe is on the box. Rats, you’ve made me soooo hungry for Mexican food, and for my recipe of homemade chili. Thank goodness we’re going for TexMex tomorrow! Hi, Caroline…. Nothing’s as good as homemade chili. Hope your Tex-Mex outing was good, too.. I predict you will like it, Tania. LOL, Brenda…Well, tortillas are a type of cornbread, aren’t they? The few times I’ve tried to make them, they have turned out as thick as cornbread. Whatever. All I can say is cornbread and chili verde seem like a natural marrying to me. … Thanks for stopping by and leaving a comment.